Posted in General, Home, Kids, Mom Stuff	by Shannon M.
Yes, it’s Back to School time! School starts for us on Monday, August 4, which seems super-early, but really, it can’t come fast enough in my opinion! But that’s another post. Back to School time means shopping to get the kids geared up and ready to go – time to replace all the clothes and shoes they outgrew and/or ruined over the summer! Shoes are always the most expensive in our household, as I refuse to buy used shoes for the kids. Clothes, fine. Shoes, no way; they need the support only new shoes, especially sneakers, can offer, in my opinion. Famous Footwear is currently running their BOGO deal: Buy one pair of shoes, get another pair of equal or lesser value for half price. I love this deal. 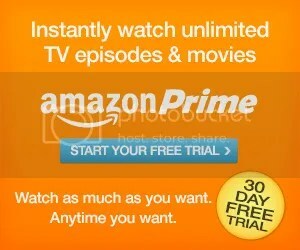 And, to top it off, if you join their Rewards program, you get a coupon for an ADDITIONAL 20% off! 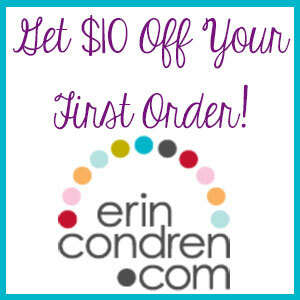 If you don’t want to join, but why wouldn’t you, you can still get a coupon for 15% off. Still a great deal. I ended up getting a pair of Skechers Light-Up sneakers (they both insisted) for each of the kids for a grand total of $40. TWO pairs of SKECHERS for $40. You can’t beat that. They’re happy, I’m happy. The Cookies are Coming, The Cookies are Coming! I’ve been at it again! 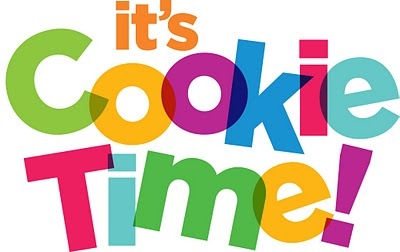 After my first round of Girl Scout printables (which are still FREE, by the way), I decided to whip up some more fun printables for my daughter to use for her cookie orders. I was so happy with how they turned out, I decided to offer them for sale. I found the super cute little girls from an amazing artist (sorry, keeping this one a secret) and I was just so tickled with how all of the cards turned out. Cookie deliveries will start this weekend, and I love that these cards will help us keep things straight as far as who ordered what, how much they owe, and how many boxes should be in their orders. Plus, they add a little extra to the deliveries, in my opinion. These Cookie Receipts are the same size as the free Thank You Notes I posted: 4.25×5.5. To make it super easy, you can buy Avery Postcards that come four to a page and are perforated. Or, print on card stock and cut them apart yourself on the guidelines. Easy peasy! These are currently available in my Etsy shop; go check them out! Posted in DIY, General, Kids, Mom Stuff	by Shannon M.
So, I might be going a little overboard with this whole Girl Scout Cookie thing. This is my daughter’s first year as a Girl Scout, she’s a Daisy, and I am so excited that she’s decided she wants to be a part of this. I was a Girl Scout for practically my entire childhood, and I have so many fond memories. I hope she has as much fun as I did! But back to the overboard part. My daughter’s troop consists of Kindergarten and First Grade-aged girls. Suffice it to say, they’re not too excited about the whole cookie booth sales thing. I’m trying to explain to my girl that it’s important to sell a lot of cookies because it helps the troop, it helps you, blah blah blah. 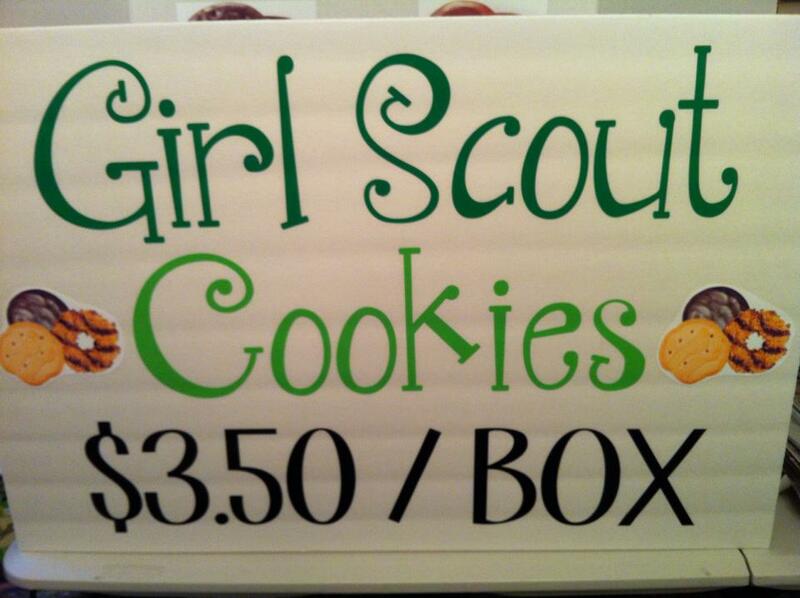 And, everyone loves Girl Scout cookies, and they love to see cute little faces selling them. I thought they turned out pretty cute, if I do say so myself. And yes, that is glitter vinyl on the Troop sign. We can all use a little extra bling! 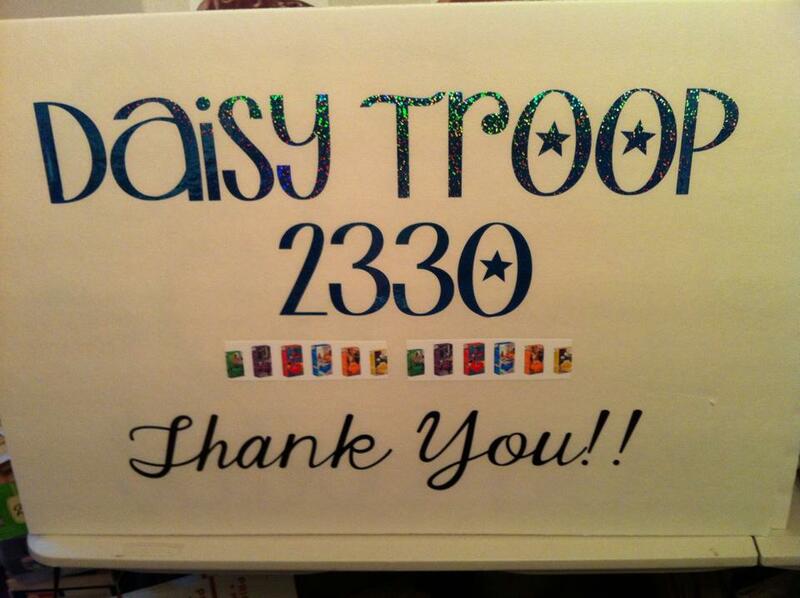 The girls all signed their names on the Troop Thank You sign, and it looks great. Is it too much, yet? Am I a normal Girl Scout Mom? 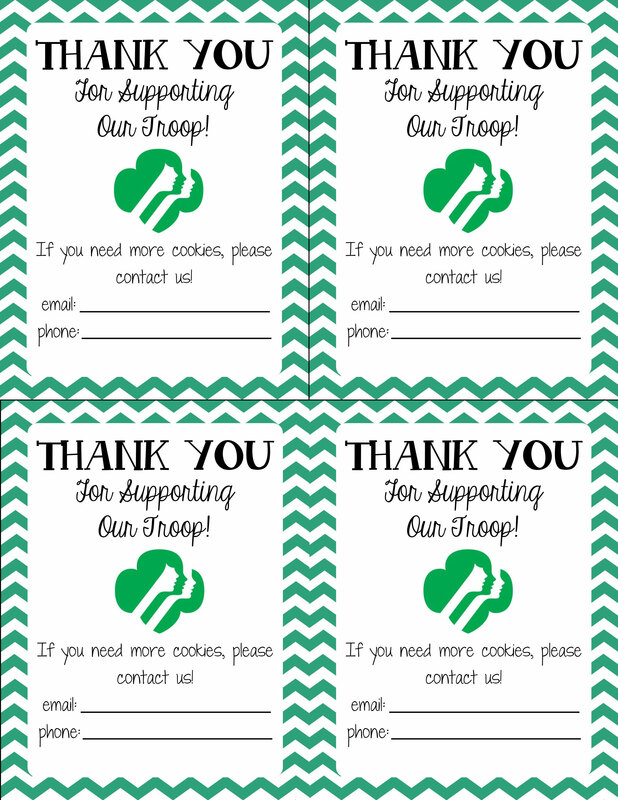 So then I was thinking, it would be nice to give each customer who buys cookies from our cookie booths a little Thank You card with our troop information on it; you know, in case they needed more cookies. Plus, it teaches the girls that a simple Thank You is a wonderful thing. I’ll also be making personalized Thank You notes for my daughter to put with her pre-orders. I’m generally not the best when it comes to writing Thank You notes, but maybe I can at least teach my children how to show their thanks. Of course, after I thought of the cards, it was all I could think about, so off I went to Photoshop to get busy. I was so happy with how the notes came out, that I decided to share them here, free to download, for whomever may find them useful. Let’s try to teach our children the art of being grateful! 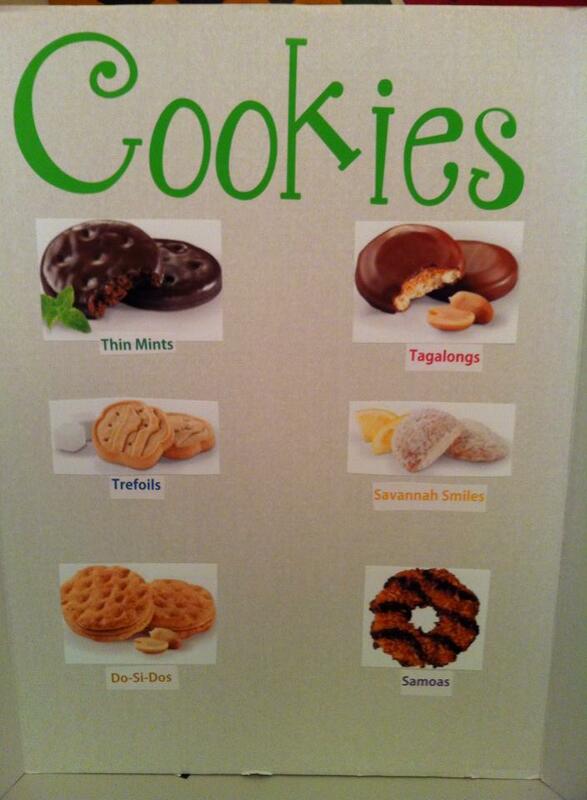 And so many people buy Girl Scout cookies, and support the organization; they especially need to be thanked. Here is an example of the personalized card I did for our troop. 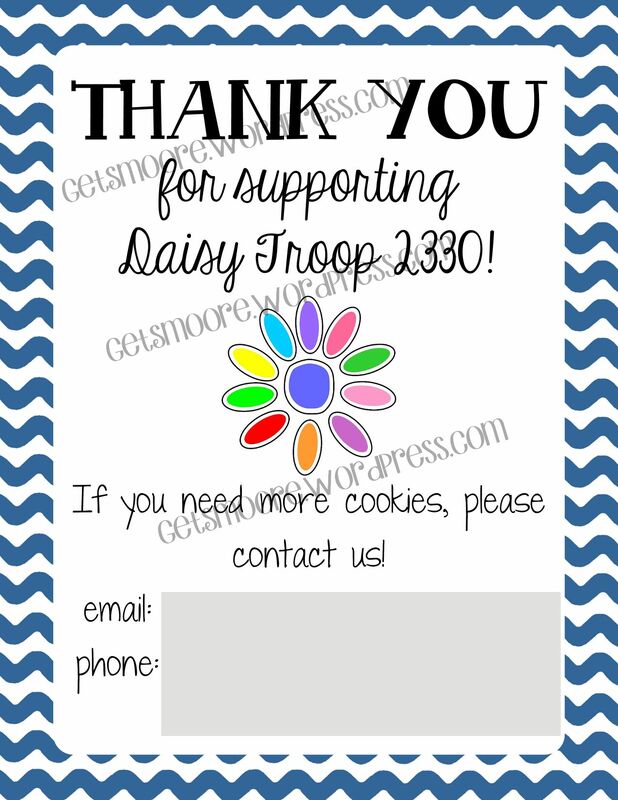 If you would like personalized cards for your troop, please contact me for pricing! Well, I guess it’s not really last minute since I still have almost a week to get these done, but still. I feel like I should have been done with my kids’ Valentines last week. I finally, just now, finished designing them, so now all I have to do is get them all printed, cut, and folded. And, then, I have to do the same for my daughter. Sure, I could go to any store and buy Valentines for both of my kids, but where’s the fun? What’s the challenge? I feel that as a ‘crafty’-type person, I should put a little more thought into these silly things. Plus, I love to see my kids’ eyes light up when I present them with the finished product. Its nice to hear “Wow, Mom, that’s awesome!” every now and then. Unlike last year, when I made what seemed like a million embroidered felt lollipop lips and mustaches, this year I decided to tone it down a notch, and stick with designing cards. A friend of mine had been asking if I could make her some matchbook sticky note holders, so as I was researching those to see exactly what she meant, I came across some matchbook treat cards. Ding! A light bulb went on above my head. I found some super cute clip art on Etsy here and here (so many great illustrators out there! ), some printable papers, fired up Photoshop, and I was off. I really loved the ninjas I found, and my 4-year old son has recently been claiming that he wants to be a ninja when he grows up, so these were perfect. Done. The owls I also loved, and my 7-year old daughter did, too, so that was easy. Done. The rest was up to me. Yes, I know that pack of M&M’s has been opened. I couldn’t resist! Your file will not have watermarks. What do you think? Are you making your kids’ Valentines this year, or are you doing store-bought? Can’t get enough ninjas? 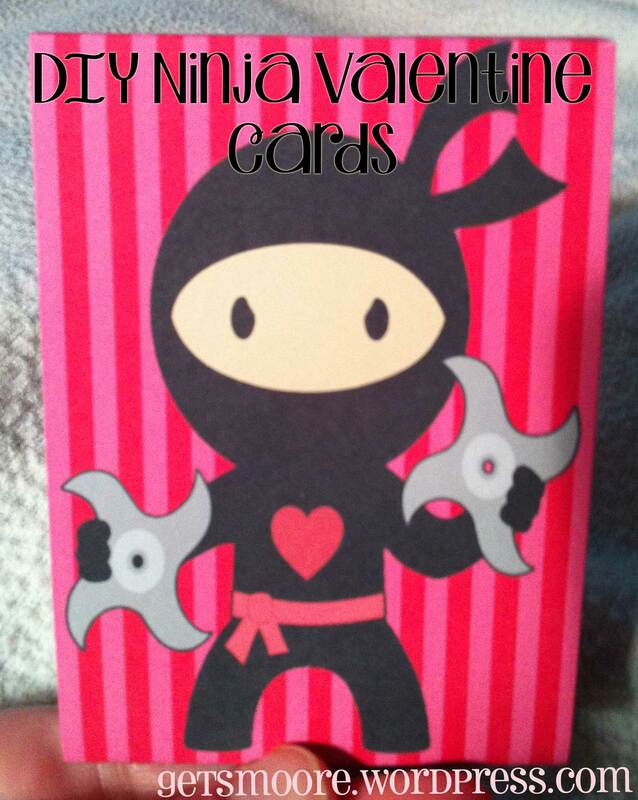 My sis-in-law has some awesome printable Ninja Activity Packs for Early Elementary over on her blog. And they’re FREE! The preschool pack is coming tomorrow, so I’ll be downloading that for my ninja-loving son. Go check it out! Posted in Cooking, DIY, Kids, Recipes, Tasty Tuesday	by Shannon M.
I have to admit: I’m a meat and potatoes kind of girl. Or, well, mainly potatoes. I’ve yet to meet a potato I don’t like. My favorite? Mashed Potatoes, hands down. Whenever my mom would make mashed potatoes when I was kid, I was right there next to the mixer, waiting to lick off the beaters. She still lets me do it, just because she still thinks it’s funny. I digress. I have nothing against frozen french fries, they’re quite good when they’re done just right. But the budget doesn’t always allow for the frozen fries, especially when you can get a giant bag of fresh potatoes for about the cost of one bag of frozen fries (I’ll have to do a cost comparison on that, actually). Plus, when I make my own, I know exactly what’s going in and on the fries. Potato, check. Olive oil, check. Sea salt and fresh ground pepper, check. That’s it! Wash and scrub about 5-6 medium russet potatoes – adjust for your family size. Slice each potato in half, then cut each half into strips, or fries. One of these days, I’m going to get a fancy french fry cutter, but for now, I use my favorite super-sharp knife. You may have to cut the fry in half again, depending on the size; you want to try and keep them around the same size so they’ll cook evenly. Continue with all of the other potatoes, until you have a pile of fries. Dump them all into a large zip-top bag, and add about 2-3 tablespoons of extra-virgin olive oil (EVOO). Use your judgement here; I usually just pour it in until it looks good. Shake the bag until all of the fries are coated. Cover a baking pan with foil, for easy cleanup, then spray lightly with cooking oil. 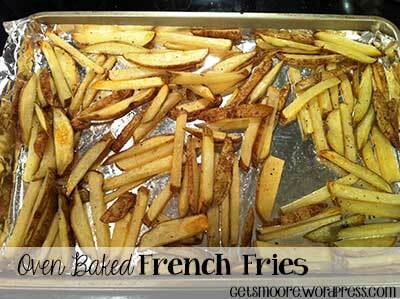 Dump the fries on the treated pan, and spread evenly, trying to keep them on one layer. Sprinkle sea salt and pepper (optional) over the entire pan. I don’t flip the fries during cooking, but if you want to give that a try, let me know how it works out! I also like to let mine get a little crispy, but not too much. This is a perfect side to make when you can’t think of anything else, and you have a bag of potatoes that need to be used up. We love to have them with hamburgers, of course. The kids love them! 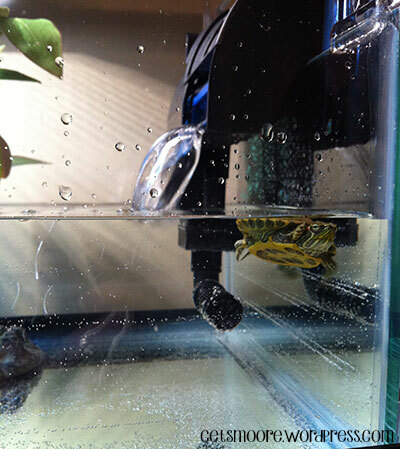 Posted in General, Home, Kids, Personal	by Shannon M.
I have nothing against turtles, really I don’t. I actually kind of like them. Well, sea turtles anyway. Whenever we go to St. Simons Island, we hop over to Jekyll Island and visit the Georgia Sea Turtle Center. I have a t-shirt. I have a hat. The kids have stuffed sea turtles, and we even have a Turtle tag on the front of our van. We’ve talked about “adopting” a sea turtle at the Center’s hospital to help support it’s treatment. But if you asked me 2 weeks ago if I wanted to have a turtle in my house, you would have gotten a firm “NO”. Enter my son’s Pre-K teacher. One morning as I was dropping him off, giving hugs and so on, I heard his teacher talking to another mom, and I could tell they were talking about turtles, but wasn’t paying that close attention. Then she looked at me and asked if my boy would want a turtle. A turtle? Sure! We love turtles, so of course he would love a turtle toy, especially a stuffed one. So I nodded, and said, Oh yeah, that would be fun. So she ran out of the door and caught that other mom, telling her to bring it at pick-up time in the afternoon. She comes back and says something I didn’t quite catch, like she’ll bring it and it’s box and stuff in the afternoon. At that point, by brain clicked on, and I said, Oh, wait, you mean a LIVE turtle? She says, yeah, is that a problem? Ummmm…. So, we have a turtle. In the house. And, I have to admit, it’s pretty darn cute. The kids have determined that it’s a girl, so her name is CeCe. She came to us in a little plastic box with about an inch of water, a couple of rocks, and some aquarium gravel. Word spread throughout our extended family, and I was quickly informed by my sister-in-law, the turtle expert (apparently), that we now owned a Red-Eared Slider, that the gravel would have to come out, it needed a bigger home with lights and plants and a “basking” rock. A what? 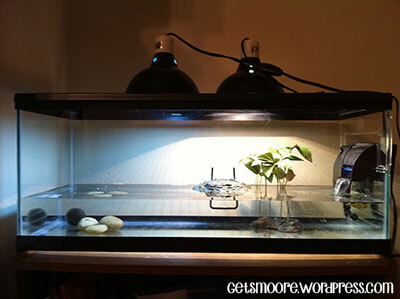 She sent me pictures of her setup, and I immediately thought: I should have kept my big mouth shut. We managed to keep CeCe alive for a week, then we decided that we should probably do something about her living situation. Luckily, the pet store actually has people that know about these things, and even have an “Aquatic Turtle Kit”, complete with everything turtle-dumb people need. Put it on plastic, please. 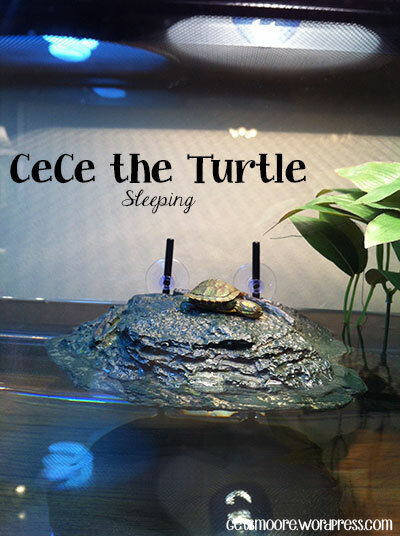 After some rearranging and managing to keep the kids calm and their hands out of the turtle aquarium, CeCe was in her new home. She seems to love it. She stretches out on that basking rock and stays there all day, nice and toasty under the heat lamp. She swims around and plays in the stream from the filter, hangs out on the rocks we took from her old home (note: not the gravel). I’ve become a turtle person. I’ve sent pictures of the turtle to my parents and other extended family. The family turtle expert approves. Posted in Home, Kids	by Shannon M.
I’m always on the lookout for ways to save money, especially now that we’re a single-income family. I use coupons, I shop at warehouse clubs, I shop the sales, and I buy store brand products when I can (at least the good ones). Grocery prices just seem to keep going up; just yesterday I noticed that our favorite brand of bread is now over $3 per loaf. The store brand of the same variety of bread is $1.99. That’s a no-brainer. And that particular store brand bread is very good. I love Publix. Something I’ve been contemplating for a while is buying more things in bulk. I love shopping at Sam’s, and do so regularly, but I generally buy the same things every time. I have been buying the large pack of single-serving applesauce cups for a while now, and the kids love them. On my most recent shopping trip, I noticed that the price had gone up to $10.68 for 36-4 ounce cups. That’s $.30 a cup, or $.07 an ounce. Not too bad, I guess, since it’s healthy-ish, and they never last long in our house. 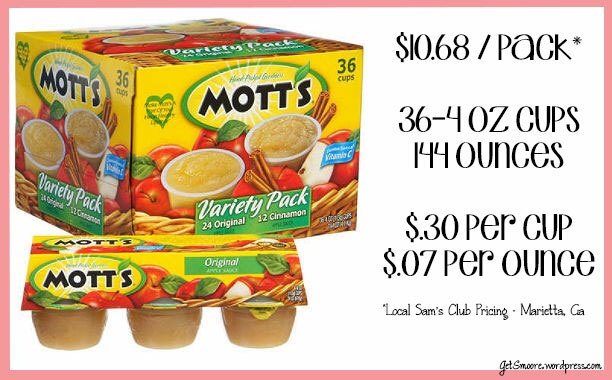 A while ago I noticed a #10 can of applesauce for only $4.48. If you don’t know what a #10 can is, it’s A LOT of food stuffed into a large can. 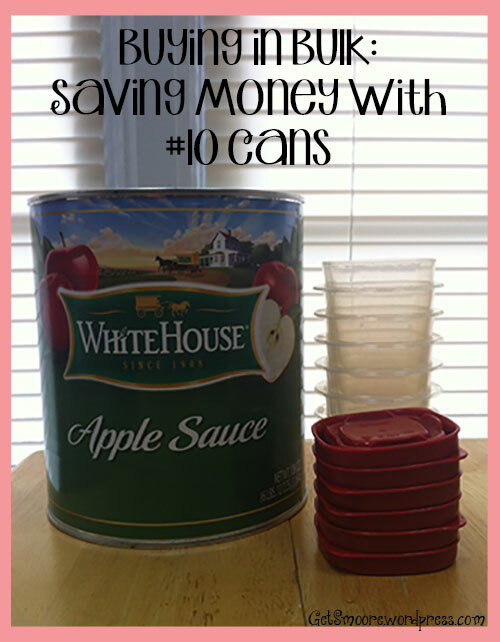 In this case, it’s the White House brand of applesauce, and the can is 108 ounces. 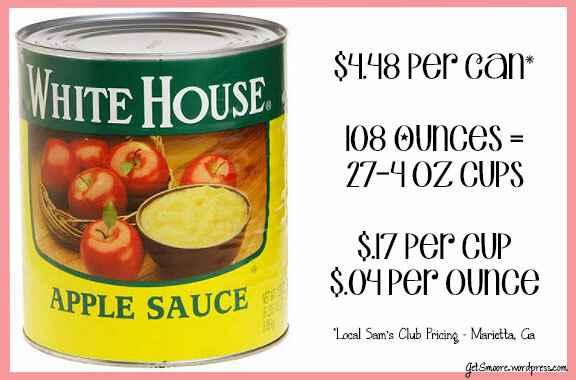 Doing a little math here, you can get 27-4 ounce cups of applesauce out of this can. For only $4.48 for the huge can, it works out to $.17 a cup, or $.04 an ounce. Ummm, I think I’ll skip the convenience and go for the giant can. I tossed one in the cart today. The next question, and the reason I hadn’t bought one of these cans before now, was how in the world are we going to eat all of this applesauce before it goes bad? Answer: small containers! I made my own single-serving cups of applesauce in my small, 4 ounce Rubbermaid containers. Four ounces is the size of the other brand’s individual cups, so the kids are used to this amount. Plus, it’s a regular serving size anyway. I spooned applesauce into 6 small cups, and tossed those in the fridge. Since I only had 6 of the small cups, I spooned applesauce into a larger 3 cup container to keep in the fridge in order to refill the the small ones as they empty (after washing, of course). This amount should keep us happy for a while. And of course, I didn’t want to waste what was left in the can, so I filled up a freezer bag with the remaining applesauce and tossed that in the freezer. Phew! That was a lot of applesauce. I know the savings is only $.03 an ounce, but you’re also saving on packaging. The containers that you use are ones that you’ll use over and over, instead of just tossing them in the recycling bin. And, in the long run, it’ll all add up. Don’t be afraid of the giant cans! I think my next adventure with #10 cans will be with ketchup. My kids eat that stuff like candy.